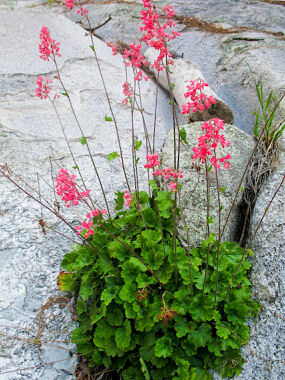 Coral Bells are a member of the Saxifrage Family. It grows to 20 inches in height and has rounded, leathery leaves with toothed margins which grow at the base of the plant to 3 inches in width. It grows in moist, shaded, rocky areas. 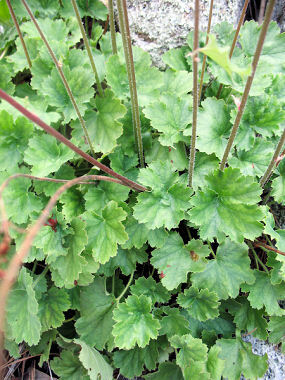 While a wildflower, Coral Bells have also become a popular ornamental plant. 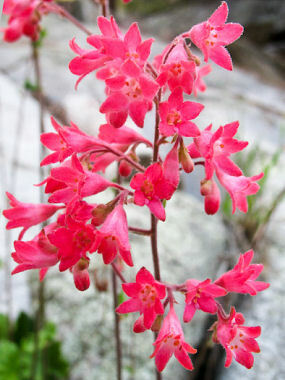 Coral Bells bloom between March - October and produce bright, coral-red bells hanging in a narrow cluster from the upper part of a nearly leafless stalk. Flowers are 0.5 inches in length and have 5 petals.